November | 2014 | Mike Lamberti, From Margate To Cleveland, And Back ! Football is generally considered a male dominated sport, but the popularity of the game certainly transcends to the women, as well. At Wayne Hills High School, football has been wildly popular, especially over the past decade, as the Patriots captured eight NJSIAA championships, not to mention the 55-game winning streak for the program from 2002-2011. Many of the players who make up the team, throughout the years, have been buoyed by supportive parents, and that was the case again in 2014. Wayne Hills finished its season on Nov. 13, with a 47-0 win over Montville in a NJSIAA consolation game. The Patriots were 5-5 this year, matching last year’s record. The finished product on the field is the result of many hours of practice and preparation. What most fans don’t see, however, is the work put it in with pre-game dinners for the players and coaches, not to mention special events before, during and after the season, such as the Kickoff Breakfast, the Mother-Son Breakfast and the Father-Son Beefsteak. The pre-game dinners are pretty special. and a number of players’ mothers contribute mightily to a great time prior to a home, or away game. There is a nice variety of food at the event, both hot and cold, as well as some enthusiastic parents who serve the players. Head coach Wayne Demikoff keeps the event at a precision level, with the seniors eating first, followed by the juniors, sophomores and freshmen. 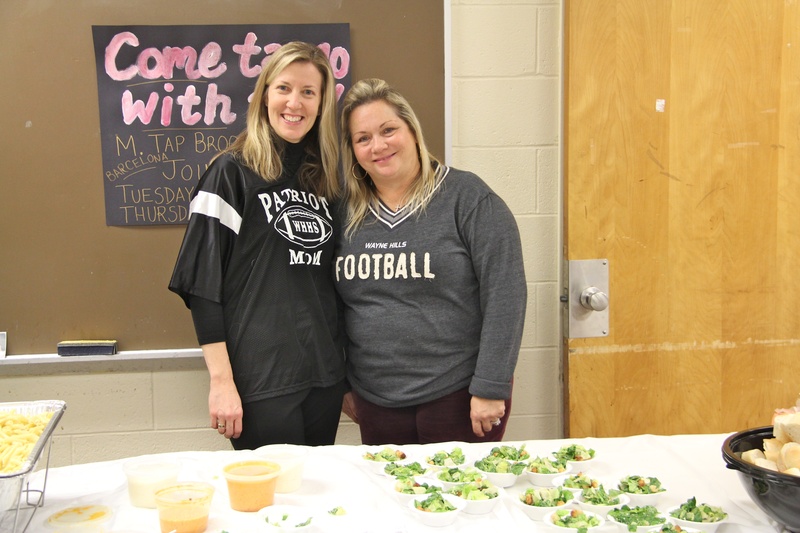 The football parents and Booster Club is led by Allyson Garrone, but she is quick to note that the dinners are a collaborative effort. Garrone also noted the successful Diamond Sponsor program the Booster Club sponsored this season, as well as protein shakes at the pre-game dinners; Squillaci providing cupcakes and Alechammas bringing Halloween candy, as well as Marsha’s husband making bracelets for the cheerleaders as gifts from the football players to the girls. So, as someone who truly appreciates how special Wayne Hills runs its football program, a sincere thanks to all the Women of Wayne Hills Football, 2014. Left to right, Julie Vigorito, Maureen Palczewski, Jen Squillaci, Marsha Alechamas, Allyson Garrone, Diane Ramsay, Stephanie Petracco and Albina Sportelli. “My mom has to be the strongest, most hard-working person I’ve ever met. I couldn’t have asked for a better mom. She dedicated the past four years of her life to my football career, and the Wayne Hills program. she works two jobs, one being football. As the 2014 high school football season winds down at Wayne Hills, there’s the usual nostalgia that comes with that, especially for the seniors. For many, the Nov. 13 game opposite Montville will be the final organized football game for the seniors, most of whom have been playing for the better part of 10 years. Along with the players, the parents also take an emotional stake in their son’s athletic endeavors. 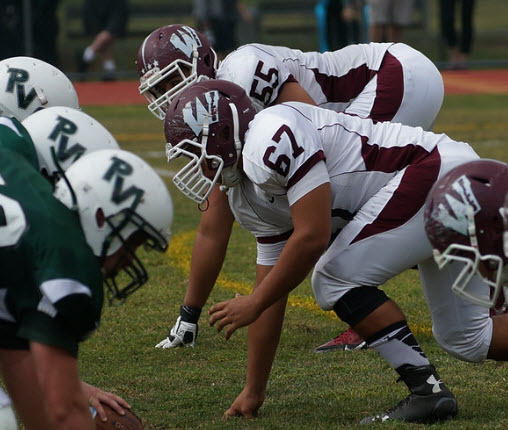 At Wayne Hills, the parental involvement is outstanding, with pre-game meals, post-game celebrations, the Kickoff breakfast in May, the Mother-Son breakfast in October, the Father-Son beefsteak on Thanksgiving Eve, and ultimately, the football dinner in early January, in which 350 to 400 people attend. Among the seniors in 2014 is Chris Garrone, a hard-nosed tailback who has been a big part of the Patriots season this fall. Garrone’s mother, Allyson, is also an integral part of what makes the program the success it is, Allyson practically lives on her computer, sending football updates to everyone on the mailing list and following up to make sure the aforementioned events are run smoothly. Chris Garrone and his mother, Allyson, at the 2014 Mother-Son breakfast. It’s that kind of effort and fortitude which makes football at Hills special. The eight state championships since 2002, the 55-game winning streak from 2004-2009 and the 19 consecutive playoff appearances reflect winning. And while this year’s team didn’t qualify for the playoffs, the work ethic never wavered. Chris Garrone wanted to make sure his mother’s work wasn’t overlooked. “My mom has to be the strongest, most hard-working person I’ve ever met,” Chris said. “I couldn’t have asked for a better mom. She dedicated the past four years of her life to my football career, and the Wayne Hills program. she works two jobs, one being football. Allyson and her husband, Bob, can certainly be proud of the young man they’ve raised. 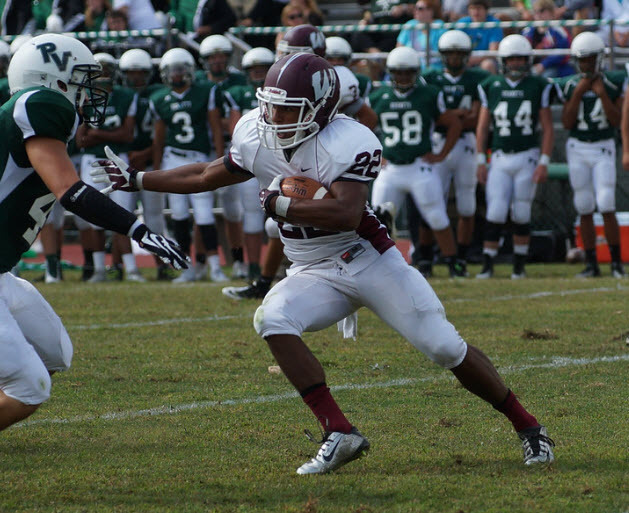 It’s been an up and down season at Wayne Hills, when it comes to football. The playoffs are not on the schedule, for the first time since 1994. The team is 3-5, with two games remaining, including an NJSIAA consolation game, which will be the first time, ever, that Hills will participate in that contest. But with that said, the Nov. 7 contest between Wayne Valley and Wayne Hills, set for Patriots Stadium, has plenty of juice. Both teams have a lot to play for, with Valley coming in at 4-4 and hoping for its first winning season in five years, after being eliminated from playoff contention last Friday night at Demarest. Hills seeks to match last season’s 5-5 mark, and a win over Valley will go a long way in accomplishing that feat. 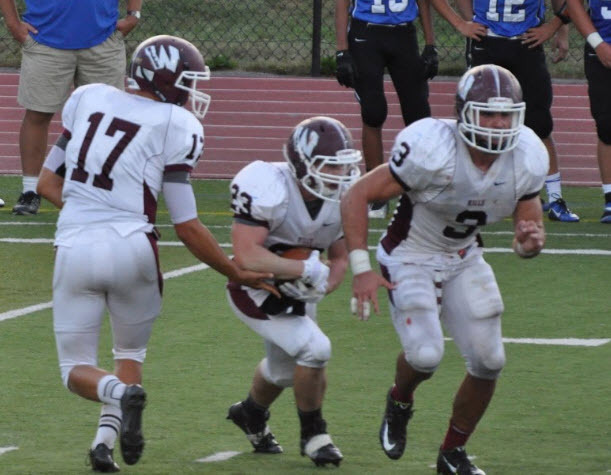 Since 2007, Wayne Hills holds a 5-1 lead in the series, including a 17-14 victory, in overtime, last year. Wayne Hills head coach Wayne Demikoff had the same message for his team throughout the week. “Let’s win the town,” was his rallying cry. “There’s going to be a lot of people here on Friday night. If you don’t think winning the town is important, then you don’t know what this game means. Both teams want it. Wayne Valley is coming here to give you their best effort. 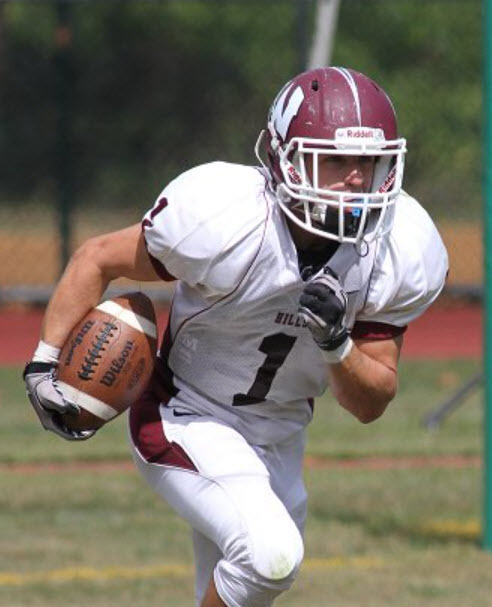 Brian Berges is a multi-talented athlete for Wayne Hills. The Patriots have been paced by the play of senior fullback and linebacker, Justin Hogan. Another senior, Chris Garrone, has been a solid running back. Brian Berges is a reliable defender with good speed. Tom Ramsay has been a consistent lineman for the Patriots, as his career winds down. The same can be said of Tyler Rigoli. Derek Bastinck is a durable offensive lineman who will play football at Bucknell next year. 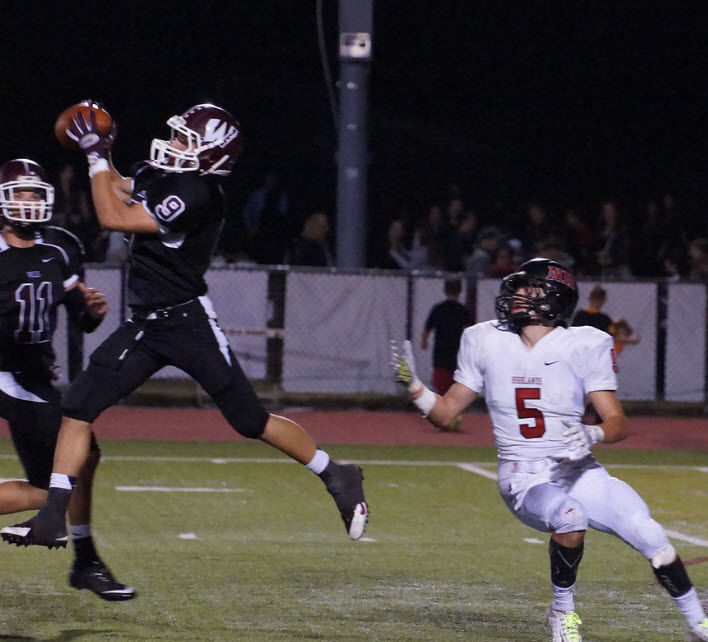 Kyle Brackett has been one of Wayne Hills best players this season, on both sides of the line. Quarterback Pete Palczewski has turned into a savvy signal caller who is doing a good job of reading defenses. Anthony Vigorito is a versatile player, who fills a number of key needs for the team. Anthony Vigorito has been a valuable Patriot for 4 years. Among the younger players who will be back in 2015, Vinny LoVerde has shown signs of being an excellent player, as have Leyshawn Askew, Joe Stambouly, Tom Skiba, Frank Petracco, Joe Kenny, Luca Catania, Emre Kaya, Luca Grave and Matt Sportelli. 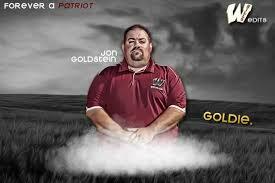 The memory of Jon Goldstein will certainly be at center stage when this game kicks off. The long time Wayne Hills coach and administrator, who grew up in Wayne and attended Wayne Valley, passed away suddenly this past January.